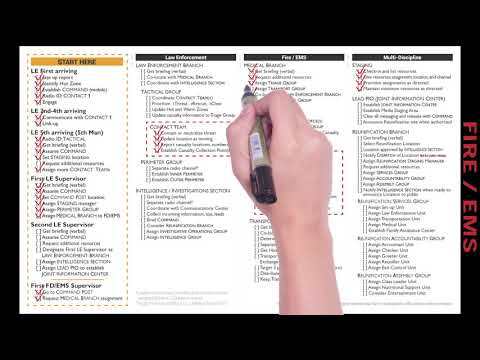 A Validated Active Shooter Checklist. 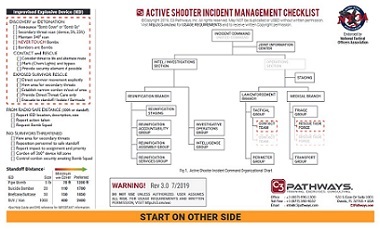 The Active Shooter Incident Management Checklist is designed for basic complexity through moderate complexity Active Shooter Events in a generic approach suitable for most communities. However, the Checklist will not be suitable for ALL communities. Each agency must evaluate if this Active Shooter Checklist is appropriate for their community, their staffing, and their risk. In June 2013, C3 Pathways published a document on Active Shooter Incident Management Best Practices based on observations from a series of Active Shooter training exercises conducted at the University of North Florida (UNF). In large part, we developed the document because what we thought we knew to be true about Active Shooter Response and Active Shooter Incident Management turned out to be untrue. Perhaps a better way to say it would be that we discovered, quite by accident, that there were better ways to manage Active Shooter Events than what we thought "we knew to be true." This realization caused our team to start over at the beginning and question everything. Along the way, we discovered a number of things. An important first step was building an accurate model of a typical Active Shooter Event, which we did based largely on the incredible research work of ALERRT - the Advanced Law Enforcement Rapid Response Training program at Texas State University. We also spent a tremendous amount of time looking at how to integrate the law enforcement and EMS response to an Active Shooter Event (ASE) and approaches to the incident management of Active Shooter Events. We did this work starting from scratch without assumptions, and specifically without the assumption that a rapid Unified Command was the best approach. What we observed from the UNF exercises suggested that early Unified Command slowed the response, which after all is what started us down this road. 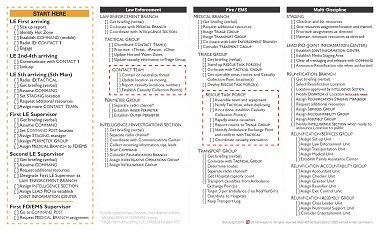 The Active Shooter Incident Management Checklist is the culmination of our work thus far. The Active Shooter Incident Management Checklist has been validated for design, content, format, and usability. Four separate validations were conducted on the Active Shooter Incident Management Checklist prior to publication. Three validations focused on design (e.g. font, size, etc) and format (layout, groupings, etc) based on aviation emergency checklist design and usability, human factors engineering, and evaluative methodologies. The final validation focused on content, the logical order of items, and usability based on feedback from 187 responders who used the Active Shooter Incident Management Checklist in live Active Shooter training exercises. Information about the validation process are in the published validation document available for review. There is still much more work to be done. Checklists are living items that must be periodically reviewed, updated, and improved -- especially through user feedback and actual experience. 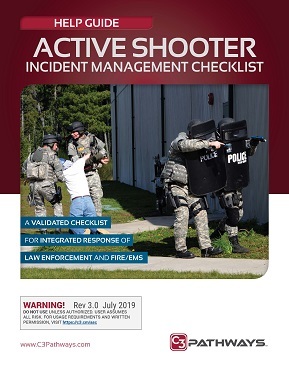 There is additional information available on our web site to aid in understanding the Active Shooter Incident Management Checklist concepts and how to use the Checklist. Use of the Active Shooter Incident Management Checklist REQUIRES AUTHORIZATION and WRITTEN PERMISSION. The Active Shooter Incident Management Checklist is the Copyrighted work of C3 Pathways, Inc. There is NO CHARGE to use the Checklist (yes, IT IS A FREE, Checklist; no cost), BUT you must receive WRITTEN PERMISSION from C3 Pathways to use it. and agree to waive liability. Please see the actual Copyright Clearance form for full details and language. The printable written certificate includes all the language agreed to and associated requirements. Please feel free to contact us should you have questions or need assistance with the Active Shooter Incident Management Checklist. We sincerely hope you never have to use the Checklist in real life. Readers are CAUTIONED that the statements contained herein may not be relevant or appropriate for their agency or region. Any new procedure or procedural change should be validated locally PRIOR TO ADOPTION. Please refer to the full text of the Copyright Clearance form for detailed requirements for using the Active Shooter Incident Management Checklist. C3 Pathways provide professional solutions to serve you so you can serve others — and save lives. Call us toll free 877-340-4032 or email us at info@c3pathways.com to learn how we can help you! *App include Copyrighted work of C3 Pathways, Inc. You must receive WRITTEN PERMISSION from C3 Pathways to use it.